Andrea Bocelli has worked with some very interesting musicians on his new album, which is his first album of new material in 14 years. He is no stranger to working with artists of different genres – having previously worked with the likes of Jennifer Lopez, Ariana Grande, Tony Bennett and Celine Dion. Hearing his collaborations are always interesting, and add a fun and often beautiful element to his work. The detail in the album and the work gone in to the album is intense and has been well thought out. Fall On Me is a special song, as it is a duet with his son, Matteo Bocelli. Matteo is only 20 years old, yet has a lot of maturity in his voice. The song is featured in the new Disney movie – The Nutcracker and The Four Realms (starring Kiera Knightley, Helen Mirren and Morgan Freeman). The song is beautiful, and their voices sound very different. It’s not like Matteo is a carbon copy of his father, they both have their own distinct style, and the result is powerful. The song reflects on the parent/child strong bond, its a fantastic song choice for them both. The song is to be released as a single, and the video to accompany the song features sweet photos of them from their private family album. Musical talent clearly runs through the family veins. 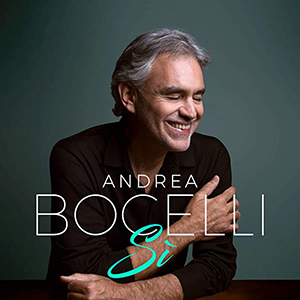 Amos Bocelli – Andrea’s son plays piano on two of the tracks on the album – in both Sono Qui (I Am Here) and Ali di Libertà. Veronica, who is married to Andrea also gets a nod, in the song Vivo, which is dedicated to her. Dua Lipa’s duets on If Only, which is a soft and slow ballad. I could imagine the song being played in the background on a movie – due to the heightened emotion in both of their voices. They blend well together and the result is really hauntingly beautiful. Following the huge success of Perfect Symphony, Andrea has collaborated again with Ed Sheeran. The song is called Amo Solatanto Te. It’s another lovely sounding song, but maybe not one that necessarily stands out straight away, it’s more of a grower – and Ed can be heard as the song comes to a close, singing the ending in English. Josh Groban’s collaboration on We Will Meet Again is a bit of a tear-jerker. It is just beautiful and epic, with sweeping orchestral moments. The lyrics hit you straight in the heart and the song is guaranteed to give you goosebumps. I can only imagine that hearing this song sung live will heighten the emotions felt from listening to it on the album. It’s a stunning piece, and one of my favourites on the album. Andrea’s fans are in for a real treat with this album. It is clear that so much hard work has gone in to making it. The 16 songs celebrate love, family, faith and hope, and are as every bit beautiful as one could hope for, coming from the amazing talent that is Andrea Bocelli.